Guide to the art and architecture of the 1937 historic Knight Library, University of Oregon, Eugene. 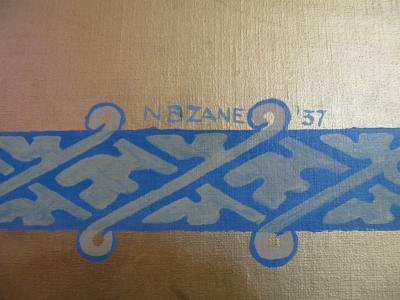 Creator: N. B. Zane. Text by Frederick G. Young. Date: 1937. Medium: Painting on canvas, affixed to niche in wall. Location: Knight Library, West stairwell. 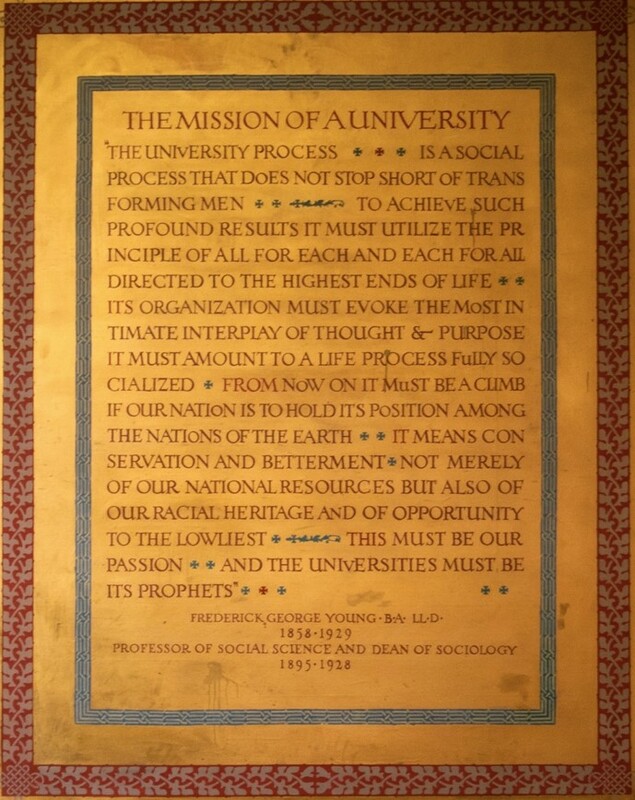 University of Oregon art professor N. B. Zane designed the mural Mission of a University using text written by Frederick G. Young, a former professor of the university and scholar of Oregon history. The original source and purpose of Young's text has yet to be discovered. He was dead six years before the new library was planned. 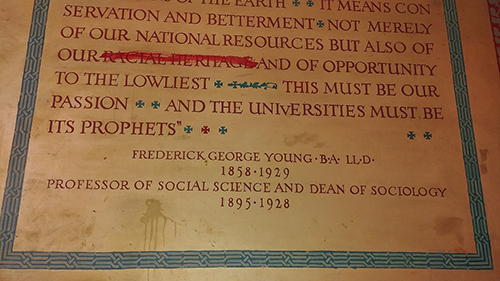 The use of Young's text for the mural was decided by others, perhaps by James Gilbert who originated the concept of the inscription murals. 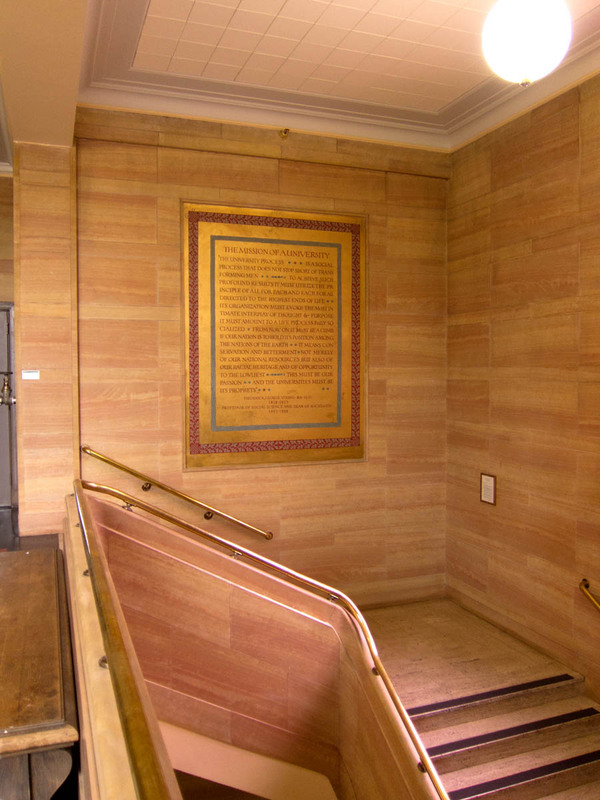 Zane also created another mural for the east stairwell, Opportunity for the Youth of Oregon, which includes the writing of a former dean, Luella Clay Carson. The University process is a social process that does not stop short of transforming men. To achieve such profound results it must utilize the principle of all for each and each for all directed to the highest ends of life. Its organization must evoke the most intimate interplay of thought & purpose. It must amount to a life process fully socialized. From now on it must be a climb if our nation is to hold its position among the nations of the Earth. It means conservation and betterment not merely of our national resources but also of our racial heritage and of opportunity to the lowliest. This must be our passion and the universities must be its prophets. Frederick George Young B.A. LL. D.
James Gilbert, dean of social science, originated the concept of the inscription murals. The Alumni Holding Company commissioned Zane to undertake the project and appointed a committee in collaboration with deans Gilbert and Lawrence to agree on the text. Zane described the murals as being executed in a manner "reminiscent of medieval missal manuscripts. They combine decorative dignity with message of immediate and lasting import." (Murals, Daily Emerald, May 12, 1937). Frederick (also spelled Frederic) George Young was a professor and administrator at the University of Oregon. Born in Wisconsin on June 3, 1858, Young graduated from Johns Hopkins University with a BA degree in 1886. After teaching in South Dakota and Wisconsin, Young moved in 1890 to Portland, Oregon, where he was a high school principal. He became president of Albany College, Albany, Oregon (which became Lewis and Clark College in Portland). In 1895, Young joined the University of Oregon as a professor in history and economics. He received an honorary PhD from UO in 1920. From 1900 to 1920 he was the first dean of the graduate school. He was dean of Oregon's School of Sociology from 1919 until his death. He was among the founders of the Oregon Historical Society (OHS). He served as secretary of OHS from 1898 to 1929, and as editor of the Oregon Historical Quarterly from 1900 to 1928. Young died on January 4, 1929. "Dr. F. G. Young of University Faculty Dies." Eugene Register-Guard, January 4, 1929, 1. Google Newspaper Archive. Frykman, George A. "Frederic G. Young, Regionalist and Historian," The Pacific Northwest Quarterly 48 no.2 (April 1957): 33–38. JSTOR 40487232 (UO access). "Murals Being Prepared for Grand Staircases of New Library." Oregon Daily Emerald, May 12, 1937.